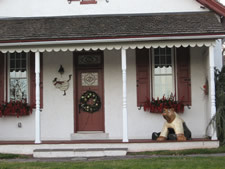 Diane Reinwalt loves Boyertown’s Bear Fever bears and wanted one of her own to add to the charm of her beloved home, a former schoolhouse along Route 663 in Gilbertsville. She requested that "Chloe" be "dressed" in a pleated skirt in country-patterned styling and colors to match the décor of her immaculately maintained home. 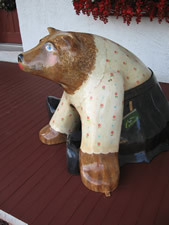 "Chloe" sits patiently on Diane’s porch—seemingly in wait for school children to arrive—and maybe for Diane to come home from her own work as postmaster. Bob’s murals can be found in Boyertown along South Reading Avenue where he re-created Dave Larson’s painting "A Special Kind of Place." A second outside mural can be found on the north wall of the State Theatre on the corner of North Reading Avenue and Fifth Street. Images from the history of Boyertown are featured. Another mural can be found inside Boyertown Multi-Service on Spring Street where assorted medals awarded to service men and women are illustrated. 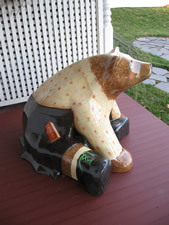 In addition to "Chloe," Bob’s contributions to the Bear Fever project include "Spike," sponsored by All Balls Bearings and Components, New Berlinville, PA; "Bear Paws" sponsored by National Penn Bank and located at the Bally branch on Main Street; “Joe Bear,” located at Serenity Junction in Boyertown, PA; and "Earl" located at Earl Elementary School in Earlville, PA.